The Decar Nickel District, which is the company’s flagship nickel property, is a greenfield discovery of nickel mineralization in the form of a naturally occurring nickel-iron alloy called awaruite. It represents a promising target for bulk-tonnage, open-pit mining. This deposit contains little or no sulphides, meaning it has little or no capacity to generate acid mine drainage. Initial metallurgical test work demonstrates the nickel-iron alloy is recoverable using conventional two-stage grinding and magnetic separation, followed by gravity concentration – and does not require chemical reagents thereby significantly reducing another potential environmental impact. Under an option agreement dated November 12, 2009, as amended between FPX Nickel, Cliffs Natural Resources Exploration Canada Inc. and Cliffs Natural Resources Exploration Inc. (collectively “Cliffs”), FPX Nickel granted Cliffs the sole and exclusive right, pursant to a series of options, to aquire up to a 75% undivided interest in the Decar property. The option agreement entitled Cliffs to acquire an initial 51% interest in the Decar property by incurring expenditures of not less than US$4.5 million over a period of four years. Cliffs was deemed to have earned a 51% interest more than two years ahead of schedule. Subject to the exercise of the first option, Cliffs was granted a second option to acquire a further 9% undivided interest in the Project by completing a Scoping study, or Preliminary Economic Assessment (“PEA”) within the following 12 months. Cliffs exercised the second option by completing a PEA, and in September 2013, announced that it intended to exercise the third option to acquire an additional 5% interest in the Project by preparing a Pre-Feasibility Study by August 2015. In August 2014, following a proxy battle, Cliffs’ Board of Directors and management were replaced. Cliffs subsequently informed FPX Nickel that, as a function of a change in strategy, nickel having been designated as non-core, its entire interest in Decar was to be put up for sale. Cliffs had incurred exploration expenditures totalling US$22 million at Decar. During late 2014 and early 2015, FPX Nickel approached Cliffs with a view to purchasing Cliffs’ 60% interest in the Project, but no transaction was agreed to at the time. On September 8, 2015, the Company announced that it had entered into a binding agreement to purchase Cliffs’ 60% ownership of Decar, for an acquisition price of US $4.75 million (the “Transaction”), resulting in FPX Nickel re-establishing 100% ownership of the Decar Nickel District. To finance the Transaction, FPX Nickel has entered into an arm’s-length loan agreement with an individual shareholder of FPX Nickel (“the Lender”), through which the Lender will lend US$5.0 million to the Company for a five-year period at a 6.5% headline interest rate. Of this, 1.5% will be paid currently, on a semi-annual basis, and the remaining 5% interest will be accrued and paid at the end of the loan term. In addition, the Lender will receive a drawdown fee equal to 4% of the loan amount and receive a 1% net smelter return (“NSR”) royalty over the Decar Nickel District. The Transaction was approved by the Company’s shareholders at a Special Meeting held on November 16, 2015 and the Transaction was completed effective November 18, 2015. 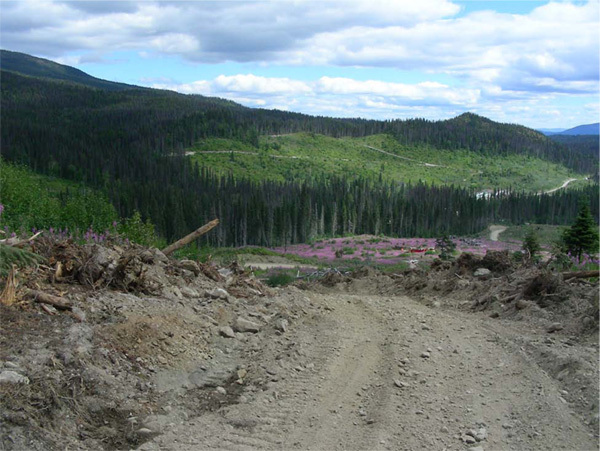 The Decar property is 245 square kilometres in size and covers part of the Mount Sidney Williams ultramafic/ophiolite complex 90 km northwest of Fort St. James in central BC. Nickel-iron alloy mineralization has been identified in four target areas within this complex as confirmed by petrographic examination, electron probe analyses and assaying. The property itself is a two hour drive from Fort St. James on a high-speed logging road (the first 40 minutes of which is a paved road). A branch line of the Canadian National Railway is less than 5 kilometres east from the Baptiste target and the BC Hydro power grid comes within 110 kilometres south of the property. The presence of these infrastructure facilities will be of significant economic benefit if a project were to be developed on this property. The “naturally occurring stainless steel” nickel-iron alloy is disseminated and relatively uniformly distributed in serpentinized peridotite rocks over a large area and represents a promising target for bulk-tonnage open-pit mining using mining methods and equipment similar to those utilized at porphyry copper deposits in production or currently under construction in British Columbia. Four targets – Baptiste, Sidney, Target B and Van – have been identified at Decar from surface samples taken at 50- to 200-metre intervals where the alloy was recognized in outcrop and confirmed by proprietary selective assaying procedures. The nickel-iron alloy is assayed by Acme Analytical Laboratories Ltd. (an ISO certified laboratory) using a selective extraction process that dissolves only the nickel present as nickel-iron alloy, without dissolving the nickel that is locked within rock-forming silicate minerals. Following independent studies to evaluate the reliability of this alloy-specific analytical method, it has been certified by Smee & Associates Consulting Ltd. This assaying procedure is proprietary to FPX Nickel and provides the Company with a significant advantage, not only in evaluating the Decar Nickel District, but also in exploring for other nickel-iron alloy targets world-wide. 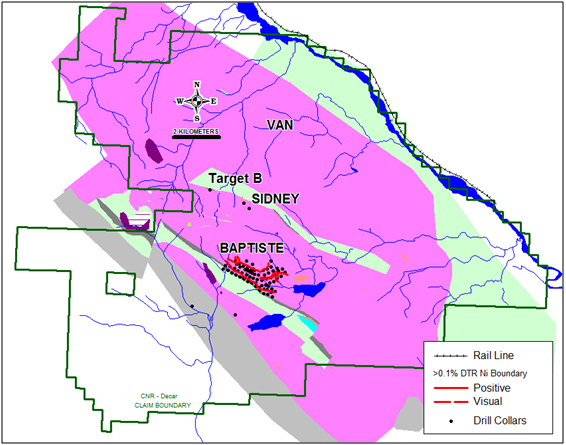 Of the four targets, Baptiste has been the main focus of drilling in 2012, 2011 and 2010, with a total of 74 delineation holes completed, whereas Sidney and Target B have seen only limited drilling. Sidney was tested with two holes in 2010 and Target B had a single hole drilled into it in 2011; all three holes intersected nickel-iron alloy mineralization at grades comparable to Baptiste. Van has not been drill-tested.